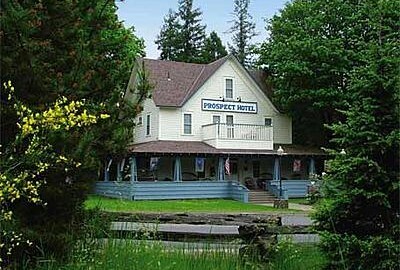 The Prospect Historic Hotel/Motel and Dinner house was built in 1888 as a stage coach stop halfway between the Rogue Valley and Crater lake. This Nationally Registered Historic Hotel has been restored for full comfort while maintaining its charm. Being the closest Bed and Breakfast to Crater Lake, only 28 miles away, the inn is a perfect home base while exploring Southern Oregon’s National Forests, Wilderness areas and BLM land, and the majestic Lake, of course. From the inn you can take a stroll to the Rogue River and three lovely waterfalls and to the Avenue of the Boulders, huge boulders thrown when Mt Mazama blew up 7000 years ago. From the Prospect Hotel head out for the day to hike, bike, raft, fish, Cross Country Ski or snow shoe. You get the picture: plenty to do from the Prospect Hotel.